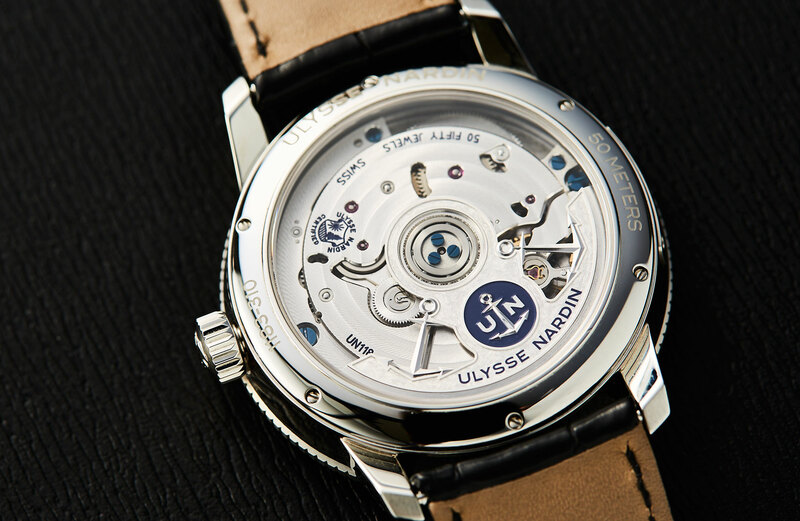 The Marine Chronometer Torpilleur shows a new, focused and driven face of Ulysse Nardin. I’m going to start this review talking not about mechanical watches, but naval warfare. In the late 19th and early 20th century, naval dominance was all about massive floating fortresses, with thick plate armour and a massed battery of cannons. These ships, which culminated in the dreadnought class of battleships, were the undisputed masters of the seas. To counter these ungainly behemoths, the Torpilleur, or torpedo boat, was developed. Streamlined, fast and modern, the Torpilleurs were armed with the latest technology — the self-propelled torpedo. These low-cost boats were intended as battleship-killers and presented a real threat to the dominance of the big ships. 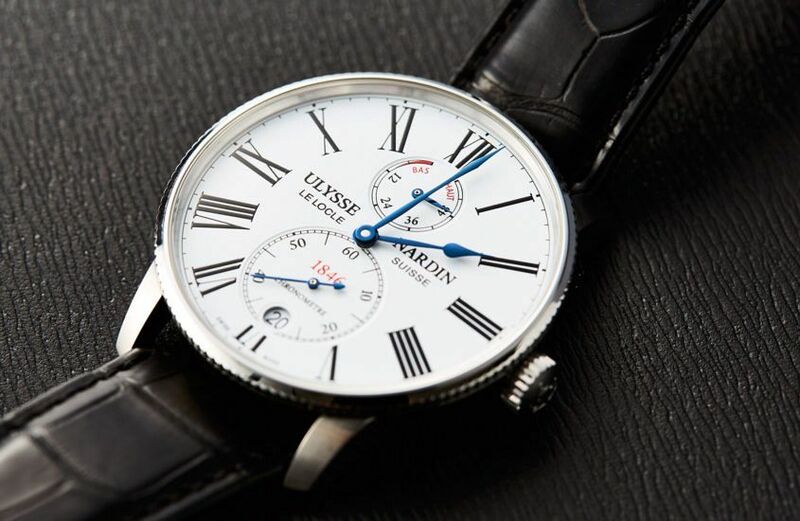 Now, do you really think it’s a coincidence that Ulysse Nardin chose to name their new, streamlined Marine Chronometer the “Torpilleur”? Of all the elements of the Torpilleur, the dial is the most traditional. 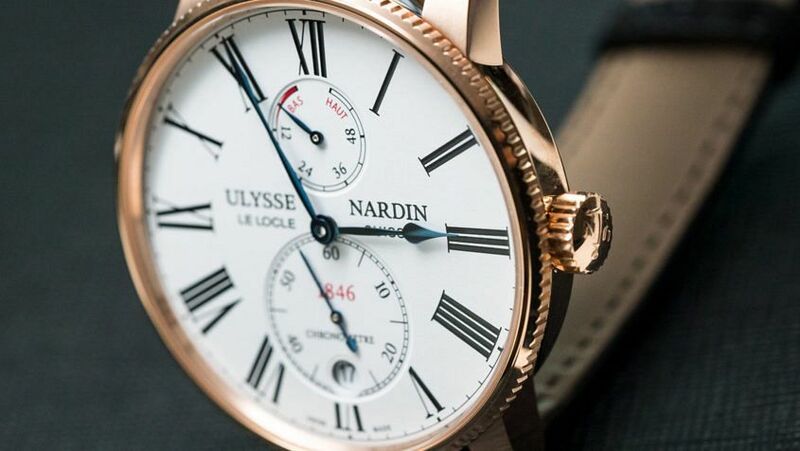 It follows the established conventions of a marine chronometer or deck watch — early navigational timepieces that put Ulysse Nardin on the map. The poire hands are blued, set against a crisp white lacquer dial, printed with bold Roman numerals, with dial text nicely balanced along the horizontal axis. The dial is balanced vertically also, with an oversized small seconds dial at six, bordered with a railroad-style chapter ring. 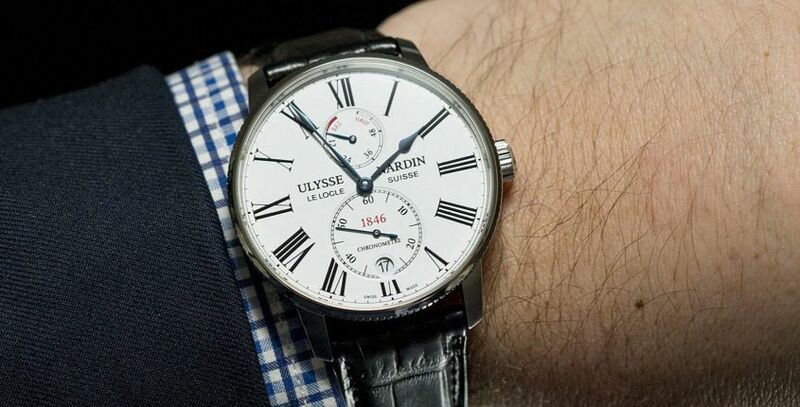 At the top of the dial is a slightly smaller power reserve indicator in the classical style. It’s hard to go wrong with the colourway of black and white, with the occasional red and blue highlight. 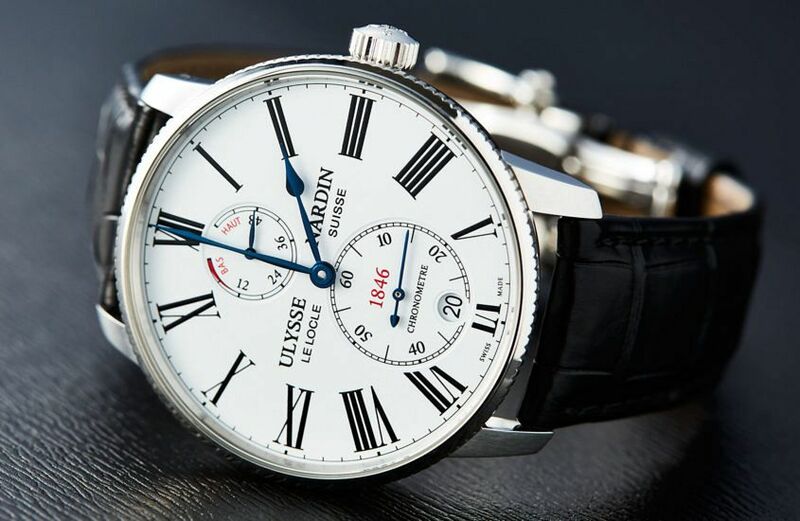 Ulysse Nardin also offer a more modern blue-dialled variant, but if timeless style is your thing, white’s the way to go. It’s worth noting that this dial is a little simpler than the fired enamel dial featured on the tourbillon, something reflected in the more accessible price. Having said that, it’s a really nicely executed dial that doesn’t challenge your expectations in any serious way. And that’s what you want in a watch like this. If the dial is business as usual for Ulysse Nardin, the case represents both a dramatic change and a return to traditionalism. 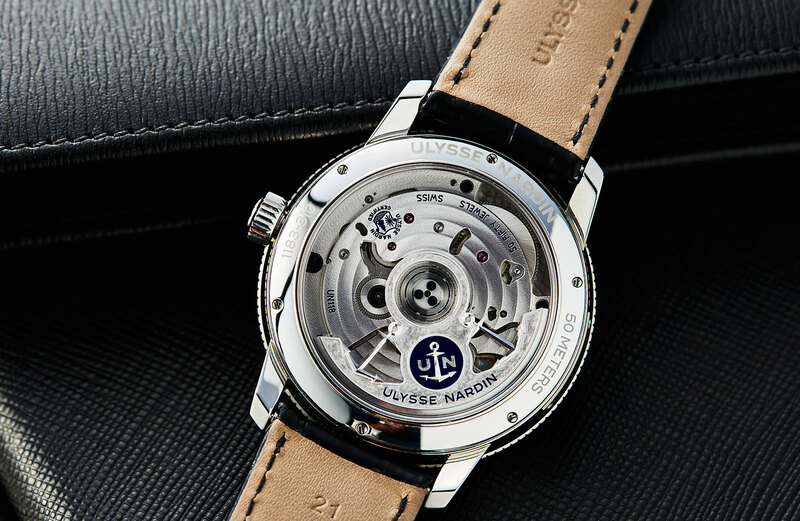 If you’re familiar with UN’s Marine collection, you’ll know that its key points of difference are the slightly blocky case shape with integrated lugs and squared-off crown guards. All that’s gone on the Torpilleur. Only the heavily notched bezel remains, and even that has been slimmed down dramatically (as has the overall case height). The result is a 42mm case that sacrifices some of its unique characteristics in favour of a more universal, classic and timeless design. Personally, I’m happy with this trade-off, and I suspect many others will be too. And while the steel version will be the most popular, there’s a gold version, too — which is my personal favourite, largely due to the contrast between the case and the blued hands. The automatic UN-118 is completely new, and it’s an attractive workhorse with quite a few noteworthy features. There’s 60 hours of power reserve, an in-house silicon hairspring and silicon escapement that’s been coated with synthetic diamond — the finish is attractive but not over-the-top. I really like the stylised oscillating weight, shaped like an anchor with three more anchors inset. My favourite detail on this rotor is the rough, hand-etched looking finish that adds some textural interest. All the Torpilleur versions are offered on alligator straps, mounted on a deployant. An entirely appropriate — if unexceptional — option. The blue-dialled version is also offered on a steel bracelet, but I haven’t seen that in person. If your personal style errs towards the formal, you’ll be happy with the Torpilleur. It’s an exceptionally traditional style that’s been given a sympathetic and nuanced modern makeover. With its thin bezel and large white dial, I found it wore quite large for 42mm, which made me really appreciate the thinner profile. If I wore a suit regularly I’d happily have this as a daily wearer. 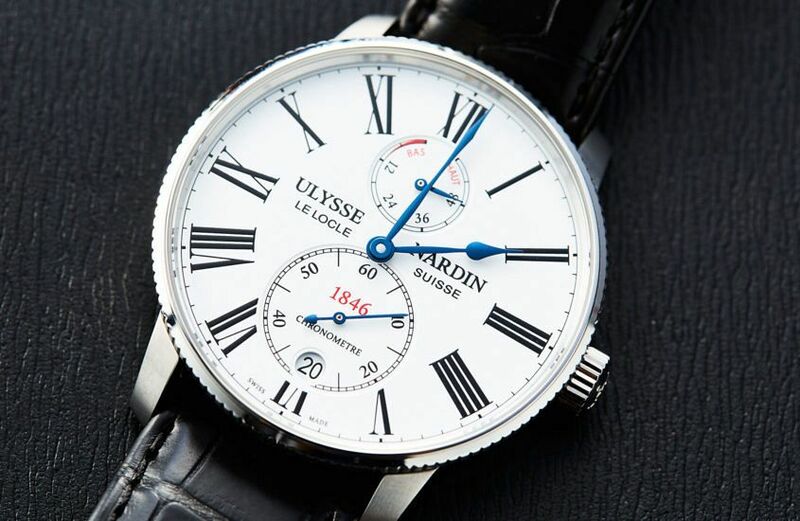 Ulysse Nardin has been quite upfront about wanting to appeal to a broader demographic, and the Torpilleur looks set to be an important flagship in achieving this mission. With its appealing style, smartly engineered case and movement, and competitive price, it certainly seems fit for purpose. If you know your horology and are looking for something a little less mainstream, this could be right for you. I’d love this watch so hard with an enamel dial. I understand it’d increase the RRP, but I think it’d be worth it.